Don’t compromise on performance, tech, or convenience – have it all with the 2018 Chevy Equinox, available at Cox Chevrolet. $5,835 off MSRP! Priced below KBB Fair Purchase Price! This 2019 Chevrolet Equinox LS in Silver Ice Metallic is well equipped with: 2 Rear USB Charging-Only Ports, 2 USB Ports & Auxiliary Input Jack, Bluetooth® For Phone, Emergency communication system: OnStar and Chevrolet connected services capable, Premium audio system: Chevrolet MyLink, Speed control. 26/32 City/Highway MPG Included 2 Year Complimentary Basic Maintenance / In Business Over 90 years / Call 1-888-844-3454 For Details. %Off Offer includes price reduction below MSRP and Cash Allowance. On Select 2019 Chevrolet Vehicles. Not available with special finance, lease or other offers. Take new retail delivery by 04/30/19. GMF Down Payment Assistance. Cash usable only if financed through a supported or unsupported GMF contract. NOT Compatible with Standalone APR Program. Customer must qualify and finance with GM Financial. See participating dealer for details. %Off Offer includes price reduction below MSRP and Cash Allowance. On Select 2019 Chevrolet Vehicles. Not available with special finance, lease or other offers. Take new retail delivery by 04/30/19. GMF Down Payment Assistance. Cash usable only if financed through a supported or unsupported GMF contract. NOT Compatible with Standalone APR Program. Customer must qualify and finance with GM Financial. See participating dealer for details. %Off Offer includes price reduction below MSRP and Cash Allowance. On Select 2019 Chevrolet Vehicles. Not available with special finance, lease or other offers. Take new retail delivery by 04/30/19. GMF Down Payment Assistance. Cash usable only if financed through a supported or unsupported GMF contract. NOT Compatible with Standalone APR Program. Customer must qualify and finance with GM Financial. See participating dealer for details. $5,835 off MSRP! Priced below KBB Fair Purchase Price! This 2019 Chevrolet Equinox LS in Nightfall Gray Metallic is well equipped with: 2 Rear USB Charging-Only Ports, 2 USB Ports & Auxiliary Input Jack, Bluetooth® For Phone, Emergency communication system: OnStar and Chevrolet connected services capable, Premium audio system: Chevrolet MyLink, Speed control. 26/32 City/Highway MPG Included 2 Year Complimentary Basic Maintenance / In Business Over 90 years / Call 1-888-844-3454 For Details. %Off Offer includes price reduction below MSRP and Cash Allowance. On Select 2019 Chevrolet Vehicles. Not available with special finance, lease or other offers. Take new retail delivery by 04/30/19. GMF Down Payment Assistance. Cash usable only if financed through a supported or unsupported GMF contract. NOT Compatible with Standalone APR Program. Customer must qualify and finance with GM Financial. See participating dealer for details. %Off Offer includes price reduction below MSRP and Cash Allowance. On Select 2019 Chevrolet Vehicles. Not available with special finance, lease or other offers. Take new retail delivery by 04/30/19. GMF Down Payment Assistance. Cash usable only if financed through a supported or unsupported GMF contract. NOT Compatible with Standalone APR Program. Customer must qualify and finance with GM Financial. See participating dealer for details. %Off Offer includes price reduction below MSRP and Cash Allowance. On Select 2019 Chevrolet Vehicles. Not available with special finance, lease or other offers. Take new retail delivery by 04/30/19. GMF Down Payment Assistance. Cash usable only if financed through a supported or unsupported GMF contract. NOT Compatible with Standalone APR Program. Customer must qualify and finance with GM Financial. See participating dealer for details. $5,535 off MSRP! Priced below KBB Fair Purchase Price! This 2019 Chevrolet Equinox LS in Sandy Ridge Metallic is well equipped with: 2 Rear USB Charging-Only Ports, 2 USB Ports & Auxiliary Input Jack, Bluetooth® For Phone, Emergency communication system: OnStar and Chevrolet connected services capable, Premium audio system: Chevrolet MyLink, Speed control. 26/32 City/Highway MPG Included 2 Year Complimentary Basic Maintenance / In Business Over 90 years / Call 1-888-844-3454 For Details. %Off Offer includes price reduction below MSRP and Cash Allowance. On Select 2019 Chevrolet Vehicles. Not available with special finance, lease or other offers. Take new retail delivery by 04/30/19. GMF Down Payment Assistance. Cash usable only if financed through a supported or unsupported GMF contract. NOT Compatible with Standalone APR Program. Customer must qualify and finance with GM Financial. See participating dealer for details. %Off Offer includes price reduction below MSRP and Cash Allowance. On Select 2019 Chevrolet Vehicles. Not available with special finance, lease or other offers. Take new retail delivery by 04/30/19. GMF Down Payment Assistance. Cash usable only if financed through a supported or unsupported GMF contract. NOT Compatible with Standalone APR Program. Customer must qualify and finance with GM Financial. See participating dealer for details. %Off Offer includes price reduction below MSRP and Cash Allowance. On Select 2019 Chevrolet Vehicles. Not available with special finance, lease or other offers. Take new retail delivery by 04/30/19. GMF Down Payment Assistance. Cash usable only if financed through a supported or unsupported GMF contract. NOT Compatible with Standalone APR Program. Customer must qualify and finance with GM Financial. See participating dealer for details. $5,535 off MSRP! Priced below KBB Fair Purchase Price! This 2019 Chevrolet Equinox LS in Nightfall Gray Metallic is well equipped with: 2 Rear USB Charging-Only Ports, 2 USB Ports & Auxiliary Input Jack, Bluetooth® For Phone, Emergency communication system: OnStar and Chevrolet connected services capable, Premium audio system: Chevrolet MyLink, Speed control. 26/32 City/Highway MPG Included 2 Year Complimentary Basic Maintenance / In Business Over 90 years / Call 1-888-844-3454 For Details. %Off Offer includes price reduction below MSRP and Cash Allowance. On Select 2019 Chevrolet Vehicles. Not available with special finance, lease or other offers. Take new retail delivery by 04/30/19. GMF Down Payment Assistance. Cash usable only if financed through a supported or unsupported GMF contract. NOT Compatible with Standalone APR Program. Customer must qualify and finance with GM Financial. See participating dealer for details. %Off Offer includes price reduction below MSRP and Cash Allowance. On Select 2019 Chevrolet Vehicles. Not available with special finance, lease or other offers. Take new retail delivery by 04/30/19. GMF Down Payment Assistance. Cash usable only if financed through a supported or unsupported GMF contract. NOT Compatible with Standalone APR Program. Customer must qualify and finance with GM Financial. See participating dealer for details. %Off Offer includes price reduction below MSRP and Cash Allowance. On Select 2019 Chevrolet Vehicles. Not available with special finance, lease or other offers. Take new retail delivery by 04/30/19. GMF Down Payment Assistance. Cash usable only if financed through a supported or unsupported GMF contract. NOT Compatible with Standalone APR Program. Customer must qualify and finance with GM Financial. See participating dealer for details. $5,535 off MSRP! Priced below KBB Fair Purchase Price! This 2019 Chevrolet Equinox LS in Silver Ice Metallic is well equipped with: 2 Rear USB Charging-Only Ports, 2 USB Ports & Auxiliary Input Jack, Bluetooth® For Phone, Emergency communication system: OnStar and Chevrolet connected services capable, Radio data system, Speed control. 26/32 City/Highway MPG Included 2 Year Complimentary Basic Maintenance / In Business Over 90 years / Call 1-888-844-3454 For Details. %Off Offer includes price reduction below MSRP and Cash Allowance. On Select 2019 Chevrolet Vehicles. Not available with special finance, lease or other offers. Take new retail delivery by 04/30/19. GMF Down Payment Assistance. Cash usable only if financed through a supported or unsupported GMF contract. NOT Compatible with Standalone APR Program. Customer must qualify and finance with GM Financial. See participating dealer for details. %Off Offer includes price reduction below MSRP and Cash Allowance. On Select 2019 Chevrolet Vehicles. Not available with special finance, lease or other offers. Take new retail delivery by 04/30/19. GMF Down Payment Assistance. Cash usable only if financed through a supported or unsupported GMF contract. NOT Compatible with Standalone APR Program. Customer must qualify and finance with GM Financial. See participating dealer for details. %Off Offer includes price reduction below MSRP and Cash Allowance. On Select 2019 Chevrolet Vehicles. Not available with special finance, lease or other offers. Take new retail delivery by 04/30/19. GMF Down Payment Assistance. Cash usable only if financed through a supported or unsupported GMF contract. NOT Compatible with Standalone APR Program. Customer must qualify and finance with GM Financial. See participating dealer for details. $5,977 off MSRP! Priced below KBB Fair Purchase Price! This 2019 Chevrolet Equinox LS in Silver Ice Metallic is well equipped with: 2 Rear USB Charging-Only Ports, 2 USB Ports & Auxiliary Input Jack, 2-Way Power Driver Lumbar Control Seat Adjuster, 8-Way Power Driver Seat Adjuster, Bluetooth® For Phone, Deep-Tinted Glass, Emergency communication system: OnStar and Chevrolet connected services capable, LS Convenience Package, Premium audio system: Chevrolet MyLink, Speed control. 26/32 City/Highway MPG Included 2 Year Complimentary Basic Maintenance / In Business Over 90 years / Call 1-888-844-3454 For Details. %Off Offer includes price reduction below MSRP and Cash Allowance. On Select 2019 Chevrolet Vehicles. Not available with special finance, lease or other offers. Take new retail delivery by 04/30/19. GMF Down Payment Assistance. Cash usable only if financed through a supported or unsupported GMF contract. NOT Compatible with Standalone APR Program. Customer must qualify and finance with GM Financial. See participating dealer for details. %Off Offer includes price reduction below MSRP and Cash Allowance. On Select 2019 Chevrolet Vehicles. Not available with special finance, lease or other offers. Take new retail delivery by 04/30/19. GMF Down Payment Assistance. Cash usable only if financed through a supported or unsupported GMF contract. NOT Compatible with Standalone APR Program. Customer must qualify and finance with GM Financial. See participating dealer for details. %Off Offer includes price reduction below MSRP and Cash Allowance. On Select 2019 Chevrolet Vehicles. Not available with special finance, lease or other offers. Take new retail delivery by 04/30/19. GMF Down Payment Assistance. Cash usable only if financed through a supported or unsupported GMF contract. NOT Compatible with Standalone APR Program. Customer must qualify and finance with GM Financial. See participating dealer for details. $5,977 off MSRP! Priced below KBB Fair Purchase Price! This 2019 Chevrolet Equinox LS in Silver Ice Metallic is well equipped with: 2 Rear USB Charging-Only Ports, 2 USB Ports & Auxiliary Input Jack, 2-Way Power Driver Lumbar Control Seat Adjuster, 8-Way Power Driver Seat Adjuster, Deep-Tinted Glass, Emergency communication system: OnStar and Chevrolet connected services capable, LS Convenience Package, Premium audio system: Chevrolet MyLink, Speed control. 26/32 City/Highway MPG Included 2 Year Complimentary Basic Maintenance / In Business Over 90 years / Call 1-888-844-3454 For Details. %Off Offer includes price reduction below MSRP and Cash Allowance. On Select 2019 Chevrolet Vehicles. Not available with special finance, lease or other offers. Take new retail delivery by 04/30/19. GMF Down Payment Assistance. Cash usable only if financed through a supported or unsupported GMF contract. NOT Compatible with Standalone APR Program. Customer must qualify and finance with GM Financial. See participating dealer for details. %Off Offer includes price reduction below MSRP and Cash Allowance. On Select 2019 Chevrolet Vehicles. Not available with special finance, lease or other offers. Take new retail delivery by 04/30/19. GMF Down Payment Assistance. Cash usable only if financed through a supported or unsupported GMF contract. NOT Compatible with Standalone APR Program. Customer must qualify and finance with GM Financial. See participating dealer for details. %Off Offer includes price reduction below MSRP and Cash Allowance. On Select 2019 Chevrolet Vehicles. Not available with special finance, lease or other offers. Take new retail delivery by 04/30/19. GMF Down Payment Assistance. Cash usable only if financed through a supported or unsupported GMF contract. NOT Compatible with Standalone APR Program. Customer must qualify and finance with GM Financial. See participating dealer for details. $5,977 off MSRP! Priced below KBB Fair Purchase Price! This 2019 Chevrolet Equinox LS in Summit White is well equipped with: 2 Rear USB Charging-Only Ports, 2 USB Ports & Auxiliary Input Jack, 2-Way Power Driver Lumbar Control Seat Adjuster, 8-Way Power Driver Seat Adjuster, Bluetooth® For Phone, Deep-Tinted Glass, Emergency communication system: OnStar and Chevrolet connected services capable, LS Convenience Package, Speed control. 26/32 City/Highway MPG Included 2 Year Complimentary Basic Maintenance / In Business Over 90 years / Call 1-888-844-3454 For Details. %Off Offer includes price reduction below MSRP and Cash Allowance. On Select 2019 Chevrolet Vehicles. Not available with special finance, lease or other offers. Take new retail delivery by 04/30/19. GMF Down Payment Assistance. Cash usable only if financed through a supported or unsupported GMF contract. NOT Compatible with Standalone APR Program. Customer must qualify and finance with GM Financial. See participating dealer for details. %Off Offer includes price reduction below MSRP and Cash Allowance. On Select 2019 Chevrolet Vehicles. Not available with special finance, lease or other offers. Take new retail delivery by 04/30/19. GMF Down Payment Assistance. Cash usable only if financed through a supported or unsupported GMF contract. NOT Compatible with Standalone APR Program. Customer must qualify and finance with GM Financial. See participating dealer for details. %Off Offer includes price reduction below MSRP and Cash Allowance. On Select 2019 Chevrolet Vehicles. Not available with special finance, lease or other offers. Take new retail delivery by 04/30/19. GMF Down Payment Assistance. Cash usable only if financed through a supported or unsupported GMF contract. NOT Compatible with Standalone APR Program. Customer must qualify and finance with GM Financial. See participating dealer for details. $5,977 off MSRP! Priced below KBB Fair Purchase Price! This 2019 Chevrolet Equinox LS in Nightfall Gray Metallic is well equipped with: 2 Rear USB Charging-Only Ports, 2 USB Ports & Auxiliary Input Jack, 2-Way Power Driver Lumbar Control Seat Adjuster, 8-Way Power Driver Seat Adjuster, Bluetooth® For Phone, Deep-Tinted Glass, Emergency communication system: OnStar and Chevrolet connected services capable, LS Convenience Package, Premium audio system: Chevrolet MyLink. 26/32 City/Highway MPG Included 2 Year Complimentary Basic Maintenance / In Business Over 90 years / Call 1-888-844-3454 For Details. %Off Offer includes price reduction below MSRP and Cash Allowance. On Select 2019 Chevrolet Vehicles. Not available with special finance, lease or other offers. Take new retail delivery by 04/30/19. GMF Down Payment Assistance. Cash usable only if financed through a supported or unsupported GMF contract. NOT Compatible with Standalone APR Program. Customer must qualify and finance with GM Financial. See participating dealer for details. %Off Offer includes price reduction below MSRP and Cash Allowance. On Select 2019 Chevrolet Vehicles. Not available with special finance, lease or other offers. Take new retail delivery by 04/30/19. GMF Down Payment Assistance. Cash usable only if financed through a supported or unsupported GMF contract. NOT Compatible with Standalone APR Program. Customer must qualify and finance with GM Financial. See participating dealer for details. %Off Offer includes price reduction below MSRP and Cash Allowance. On Select 2019 Chevrolet Vehicles. Not available with special finance, lease or other offers. Take new retail delivery by 04/30/19. GMF Down Payment Assistance. Cash usable only if financed through a supported or unsupported GMF contract. NOT Compatible with Standalone APR Program. Customer must qualify and finance with GM Financial. See participating dealer for details. $5,977 off MSRP! Priced below KBB Fair Purchase Price! This 2019 Chevrolet Equinox LS in Nightfall Gray Metallic is well equipped with: 2 Rear USB Charging-Only Ports, 2 USB Ports & Auxiliary Input Jack, 2-Way Power Driver Lumbar Control Seat Adjuster, 8-Way Power Driver Seat Adjuster, Bluetooth® For Phone, Deep-Tinted Glass, Emergency communication system: OnStar and Chevrolet connected services capable, LS Convenience Package, Premium audio system: Chevrolet MyLink, Speed control. 26/32 City/Highway MPG Included 2 Year Complimentary Basic Maintenance / In Business Over 90 years / Call 1-888-844-3454 For Details. %Off Offer includes price reduction below MSRP and Cash Allowance. On Select 2019 Chevrolet Vehicles. Not available with special finance, lease or other offers. Take new retail delivery by 04/30/19. GMF Down Payment Assistance. Cash usable only if financed through a supported or unsupported GMF contract. NOT Compatible with Standalone APR Program. Customer must qualify and finance with GM Financial. See participating dealer for details. %Off Offer includes price reduction below MSRP and Cash Allowance. On Select 2019 Chevrolet Vehicles. Not available with special finance, lease or other offers. Take new retail delivery by 04/30/19. GMF Down Payment Assistance. Cash usable only if financed through a supported or unsupported GMF contract. NOT Compatible with Standalone APR Program. Customer must qualify and finance with GM Financial. See participating dealer for details. %Off Offer includes price reduction below MSRP and Cash Allowance. On Select 2019 Chevrolet Vehicles. Not available with special finance, lease or other offers. Take new retail delivery by 04/30/19. GMF Down Payment Assistance. Cash usable only if financed through a supported or unsupported GMF contract. NOT Compatible with Standalone APR Program. Customer must qualify and finance with GM Financial. See participating dealer for details. $5,977 off MSRP! Priced below KBB Fair Purchase Price! This 2019 Chevrolet Equinox LS in Summit White is well equipped with: 2 Rear USB Charging-Only Ports, 2 USB Ports & Auxiliary Input Jack, 2-Way Power Driver Lumbar Control Seat Adjuster, 8-Way Power Driver Seat Adjuster, Bluetooth® For Phone, Deep-Tinted Glass, Emergency communication system: OnStar and Chevrolet connected services capable, LS Convenience Package, Premium audio system: Chevrolet MyLink, Speed control. 26/32 City/Highway MPG Included 2 Year Complimentary Basic Maintenance / In Business Over 90 years / Call 1-888-844-3454 For Details. %Off Offer includes price reduction below MSRP and Cash Allowance. On Select 2019 Chevrolet Vehicles. Not available with special finance, lease or other offers. Take new retail delivery by 04/30/19. GMF Down Payment Assistance. Cash usable only if financed through a supported or unsupported GMF contract. NOT Compatible with Standalone APR Program. Customer must qualify and finance with GM Financial. See participating dealer for details. %Off Offer includes price reduction below MSRP and Cash Allowance. On Select 2019 Chevrolet Vehicles. Not available with special finance, lease or other offers. Take new retail delivery by 04/30/19. GMF Down Payment Assistance. Cash usable only if financed through a supported or unsupported GMF contract. NOT Compatible with Standalone APR Program. Customer must qualify and finance with GM Financial. See participating dealer for details. %Off Offer includes price reduction below MSRP and Cash Allowance. On Select 2019 Chevrolet Vehicles. Not available with special finance, lease or other offers. Take new retail delivery by 04/30/19. GMF Down Payment Assistance. Cash usable only if financed through a supported or unsupported GMF contract. NOT Compatible with Standalone APR Program. Customer must qualify and finance with GM Financial. See participating dealer for details. $5,977 off MSRP! Priced below KBB Fair Purchase Price! This 2019 Chevrolet Equinox LS in Nightfall Gray Metallic is well equipped with: 2 Rear USB Charging-Only Ports, 2 USB Ports & Auxiliary Input Jack, 2-Way Power Driver Lumbar Control Seat Adjuster, 8-Way Power Driver Seat Adjuster, Bluetooth® For Phone, Deep-Tinted Glass, LS Convenience Package, Premium audio system: Chevrolet MyLink, Speed control. 26/32 City/Highway MPG Included 2 Year Complimentary Basic Maintenance / In Business Over 90 years / Call 1-888-844-3454 For Details. %Off Offer includes price reduction below MSRP and Cash Allowance. On Select 2019 Chevrolet Vehicles. Not available with special finance, lease or other offers. Take new retail delivery by 04/30/19. GMF Down Payment Assistance. Cash usable only if financed through a supported or unsupported GMF contract. NOT Compatible with Standalone APR Program. Customer must qualify and finance with GM Financial. See participating dealer for details. %Off Offer includes price reduction below MSRP and Cash Allowance. On Select 2019 Chevrolet Vehicles. Not available with special finance, lease or other offers. Take new retail delivery by 04/30/19. GMF Down Payment Assistance. Cash usable only if financed through a supported or unsupported GMF contract. NOT Compatible with Standalone APR Program. Customer must qualify and finance with GM Financial. See participating dealer for details. %Off Offer includes price reduction below MSRP and Cash Allowance. On Select 2019 Chevrolet Vehicles. Not available with special finance, lease or other offers. Take new retail delivery by 04/30/19. GMF Down Payment Assistance. Cash usable only if financed through a supported or unsupported GMF contract. NOT Compatible with Standalone APR Program. Customer must qualify and finance with GM Financial. See participating dealer for details. $5,617 off MSRP! Priced below KBB Fair Purchase Price! This 2019 Chevrolet Equinox LS in Kinetic Blue Metallic is well equipped with: 2 Rear USB Charging-Only Ports, 2 USB Ports & Auxiliary Input Jack, Bluetooth® For Phone, Emergency communication system: OnStar and Chevrolet connected services capable, Premium audio system: Chevrolet MyLink, Speed control. 26/32 City/Highway MPG Included 2 Year Complimentary Basic Maintenance / In Business Over 90 years / Call 1-888-844-3454 For Details. %Off Offer includes price reduction below MSRP and Cash Allowance. On Select 2019 Chevrolet Vehicles. Not available with special finance, lease or other offers. Take new retail delivery by 04/30/19. GMF Down Payment Assistance. Cash usable only if financed through a supported or unsupported GMF contract. NOT Compatible with Standalone APR Program. Customer must qualify and finance with GM Financial. See participating dealer for details. %Off Offer includes price reduction below MSRP and Cash Allowance. On Select 2019 Chevrolet Vehicles. Not available with special finance, lease or other offers. Take new retail delivery by 04/30/19. GMF Down Payment Assistance. Cash usable only if financed through a supported or unsupported GMF contract. NOT Compatible with Standalone APR Program. Customer must qualify and finance with GM Financial. See participating dealer for details. %Off Offer includes price reduction below MSRP and Cash Allowance. On Select 2019 Chevrolet Vehicles. Not available with special finance, lease or other offers. Take new retail delivery by 04/30/19. GMF Down Payment Assistance. Cash usable only if financed through a supported or unsupported GMF contract. NOT Compatible with Standalone APR Program. Customer must qualify and finance with GM Financial. See participating dealer for details. $6,017 off MSRP! Priced below KBB Fair Purchase Price! This 2019 Chevrolet Equinox LS in Nightfall Gray Metallic is well equipped with: 2 Rear USB Charging-Only Ports, 2 USB Ports & Auxiliary Input Jack, 2-Way Power Driver Lumbar Control Seat Adjuster, 8-Way Power Driver Seat Adjuster, Bluetooth® For Phone, Deep-Tinted Glass, Emergency communication system: OnStar and Chevrolet connected services capable, LS Convenience Package, Premium audio system: Chevrolet MyLink, Speed control. 26/32 City/Highway MPG Included 2 Year Complimentary Basic Maintenance / In Business Over 90 years / Call 1-888-844-3454 For Details. %Off Offer includes price reduction below MSRP and Cash Allowance. On Select 2019 Chevrolet Vehicles. Not available with special finance, lease or other offers. Take new retail delivery by 04/30/19. GMF Down Payment Assistance. Cash usable only if financed through a supported or unsupported GMF contract. NOT Compatible with Standalone APR Program. Customer must qualify and finance with GM Financial. See participating dealer for details. %Off Offer includes price reduction below MSRP and Cash Allowance. On Select 2019 Chevrolet Vehicles. Not available with special finance, lease or other offers. Take new retail delivery by 04/30/19. GMF Down Payment Assistance. Cash usable only if financed through a supported or unsupported GMF contract. NOT Compatible with Standalone APR Program. Customer must qualify and finance with GM Financial. See participating dealer for details. %Off Offer includes price reduction below MSRP and Cash Allowance. On Select 2019 Chevrolet Vehicles. Not available with special finance, lease or other offers. Take new retail delivery by 04/30/19. GMF Down Payment Assistance. Cash usable only if financed through a supported or unsupported GMF contract. NOT Compatible with Standalone APR Program. Customer must qualify and finance with GM Financial. See participating dealer for details. $5,677 off MSRP! Priced below KBB Fair Purchase Price! This 2019 Chevrolet Equinox LS in Sandy Ridge Metallic is well equipped with: 2 Rear USB Charging-Only Ports, 2 USB Ports & Auxiliary Input Jack, 2-Way Power Driver Lumbar Control Seat Adjuster, 8-Way Power Driver Seat Adjuster, Bluetooth® For Phone, Deep-Tinted Glass, Emergency communication system: OnStar and Chevrolet connected services capable, LS Convenience Package, Premium audio system: Chevrolet MyLink, Speed control. 26/32 City/Highway MPG Included 2 Year Complimentary Basic Maintenance / In Business Over 90 years / Call 1-888-844-3454 For Details. %Off Offer includes price reduction below MSRP and Cash Allowance. On Select 2019 Chevrolet Vehicles. Not available with special finance, lease or other offers. Take new retail delivery by 04/30/19. GMF Down Payment Assistance. Cash usable only if financed through a supported or unsupported GMF contract. NOT Compatible with Standalone APR Program. Customer must qualify and finance with GM Financial. See participating dealer for details. %Off Offer includes price reduction below MSRP and Cash Allowance. On Select 2019 Chevrolet Vehicles. Not available with special finance, lease or other offers. Take new retail delivery by 04/30/19. GMF Down Payment Assistance. Cash usable only if financed through a supported or unsupported GMF contract. NOT Compatible with Standalone APR Program. Customer must qualify and finance with GM Financial. See participating dealer for details. %Off Offer includes price reduction below MSRP and Cash Allowance. On Select 2019 Chevrolet Vehicles. Not available with special finance, lease or other offers. Take new retail delivery by 04/30/19. GMF Down Payment Assistance. Cash usable only if financed through a supported or unsupported GMF contract. NOT Compatible with Standalone APR Program. Customer must qualify and finance with GM Financial. See participating dealer for details. $5,677 off MSRP! Priced below KBB Fair Purchase Price! This 2019 Chevrolet Equinox LS in Mosaic Black Metallic is well equipped with: 2 Rear USB Charging-Only Ports, 2 USB Ports & Auxiliary Input Jack, 2-Way Power Driver Lumbar Control Seat Adjuster, 8-Way Power Driver Seat Adjuster, Deep-Tinted Glass, Emergency communication system: OnStar and Chevrolet connected services capable, LS Convenience Package, Premium audio system: Chevrolet MyLink, Speed control. 26/32 City/Highway MPG Included 2 Year Complimentary Basic Maintenance / In Business Over 90 years / Call 1-888-844-3454 For Details. %Off Offer includes price reduction below MSRP and Cash Allowance. On Select 2019 Chevrolet Vehicles. Not available with special finance, lease or other offers. Take new retail delivery by 04/30/19. GMF Down Payment Assistance. Cash usable only if financed through a supported or unsupported GMF contract. NOT Compatible with Standalone APR Program. Customer must qualify and finance with GM Financial. See participating dealer for details. %Off Offer includes price reduction below MSRP and Cash Allowance. On Select 2019 Chevrolet Vehicles. Not available with special finance, lease or other offers. Take new retail delivery by 04/30/19. GMF Down Payment Assistance. Cash usable only if financed through a supported or unsupported GMF contract. NOT Compatible with Standalone APR Program. Customer must qualify and finance with GM Financial. See participating dealer for details. %Off Offer includes price reduction below MSRP and Cash Allowance. On Select 2019 Chevrolet Vehicles. Not available with special finance, lease or other offers. Take new retail delivery by 04/30/19. GMF Down Payment Assistance. Cash usable only if financed through a supported or unsupported GMF contract. NOT Compatible with Standalone APR Program. Customer must qualify and finance with GM Financial. See participating dealer for details. $5,677 off MSRP! Priced below KBB Fair Purchase Price! This 2019 Chevrolet Equinox LS in Summit White is well equipped with: 2 Rear USB Charging-Only Ports, 2 USB Ports & Auxiliary Input Jack, 2-Way Power Driver Lumbar Control Seat Adjuster, 8-Way Power Driver Seat Adjuster, Bluetooth® For Phone, Deep-Tinted Glass, Emergency communication system: OnStar and Chevrolet connected services capable, LS Convenience Package, Premium audio system: Chevrolet MyLink, Speed control. 26/32 City/Highway MPG Included 2 Year Complimentary Basic Maintenance / In Business Over 90 years / Call 1-888-844-3454 For Details. %Off Offer includes price reduction below MSRP and Cash Allowance. On Select 2019 Chevrolet Vehicles. Not available with special finance, lease or other offers. Take new retail delivery by 04/30/19. GMF Down Payment Assistance. Cash usable only if financed through a supported or unsupported GMF contract. NOT Compatible with Standalone APR Program. Customer must qualify and finance with GM Financial. See participating dealer for details. %Off Offer includes price reduction below MSRP and Cash Allowance. On Select 2019 Chevrolet Vehicles. Not available with special finance, lease or other offers. Take new retail delivery by 04/30/19. GMF Down Payment Assistance. Cash usable only if financed through a supported or unsupported GMF contract. NOT Compatible with Standalone APR Program. Customer must qualify and finance with GM Financial. See participating dealer for details. %Off Offer includes price reduction below MSRP and Cash Allowance. On Select 2019 Chevrolet Vehicles. Not available with special finance, lease or other offers. Take new retail delivery by 04/30/19. GMF Down Payment Assistance. Cash usable only if financed through a supported or unsupported GMF contract. NOT Compatible with Standalone APR Program. Customer must qualify and finance with GM Financial. See participating dealer for details. Looking for a compact SUV with plenty of punch? With up to an EPA-estimated 40 mpg highway and a variety of tech features, the new Chevy Equinox fits the bill. The Equinox comes standard with Chevy MyLink infotainment, so you can access a 7-inch diagonal color touch-screen and even upgrade to available 4G LTE Wi-Fi. Ensure passenger safety from angle thanks to the help of the surround vision camera that’s equipped on every trim. Despite enough space to accommodate the whole family comfortably, the Equinox is still capable of offering up to 40 mpg highway on select trim levels. The standard 1.5L turbo engine offers an optimal blend of efficiency and power. Plus, your vehicle will be able to achieve up to 32 mpg highway. If you want a vehicle that can do it all, then you need to be behind the wheel of the 2018 Chevy Equinox. This compact SUV offers the the best in style, performance, technology, and safety, including advanced amenities like in-car Wi-Fi and 10 available active safety assist features. 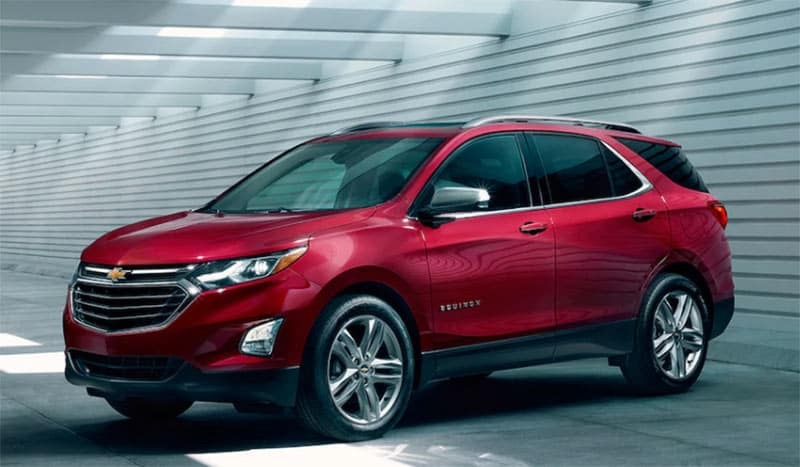 Whether you’re looking for a family vehicle or simply want a well-rounded SUV, the new Equinox at Cox Chevrolet is a vehicle you won’t want to miss. The new Equinox has a lot to offer – all that’s missing is you behind the wheel. To get a closer look at the Chevy Equinox for sale in Bradenton, FL, visit us at Cox Chevrolet today. *All leases, 10,000 miles per year with $3,000 down for well qualified customers, must be approved by GM Financial. Customer must qualify for Chevrolet lease loyalty, gm lease loyalty, or non gm competitive lease incentives from the manufacture. All prices include Bonus Tag Rebates. Plus, taxes, title, tag, and $599 dealer fee and any local or regional taxes. Security deposit waives. Excess miles $.20 per mile. Customer is responsible for any excessive wear and tear on the vehicle per the lease contract. Must be in stock with Cox Chevrolet as dealer to whom it was delivered to. See dealer for details. Offer expires 08/31/2018.